If you time it right, you can harvest a tasty treat for yourself, right off Nova Scotia’s shores. Called dulse, this delight grows on the Fundy shore near Parrsboro. You have only a two- or three-day window, however, to easily access this unique plant. According to Denise Adams, author of Atlantic Coast Gardening, dulse is best gathered during the two lowest tides of the year (see www.bayoffundytourism.com for precise dates). Denise notes that the patches of reddish-brown kelp abound in long sheets, covering the sea floor, and can only be reached as the tide recedes. A single leaf of this edible seaweed can reach over 1 meter (3 ft.) in length, not counting the stem. It is gathered in mesh bags to allow the sea water to drain. 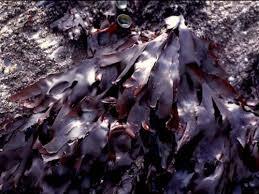 Dulse can be dried naturally over large sea rocks in four hours or three days, depending on the humidity. It must be brought indoors, however, if the weather turns wet; otherwise it will rot. 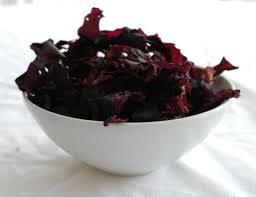 When dulse is dry to the touch and still pliable, it boasts a purple hue. It enjoys an incredibly long shelf life when stored away from sunlight and humidity. That sounds okay, but how do we get it table ready? Simple, says Denise, just use it in place of salt. Use it in pizza dough, as chips (easily dried in the microwave for 5-10 seconds) or garnishes (fold over and cut with scissors). You can use it in pasta, rice, soups, meats, seafood casseroles, or even on potatoes and other vegetables. It’s always a visual treat in salads as well. Keep in mind that 3 tsp. crushed dulse equates to 1 tsp. salt. And of course it adds extra minerals and nutrients salt cannot provide. On a gray winter day, try a dulse tonic: pour boiling water over a tea-bag quantity of dulse with a dash of cayenne pepper. Drain and enjoy this unique broth of the sea—and “a remedy for homesick Maritimers,” says Denise. 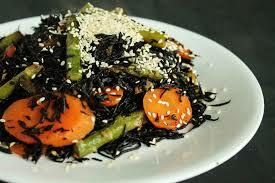 Ready to try this amazing sea plant? After all, it is our next-door neighbor. Welcome it home and you won’t be disappointed. As a gardener with years of experience growing sea-hardy flowers, vegetables and shrubs, with an emphasis on natural surroundings, Denise will have lots of information to share when she is guest speaker at the Club’s May 18th meeting. –Information in this post is taken from Atlantic Coastal Gardening by Denise Adams—superb pictures and a great read! This entry was posted in Gardening, Horticulture, Seaweed and tagged Dulce. Bookmark the permalink.